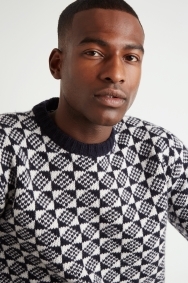 Stay warm and looking sharp. 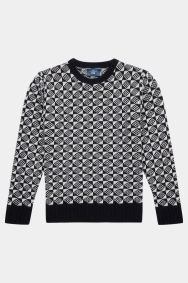 This graphic patterned jumper will bring eye-catching texture to your casual wardrobe. 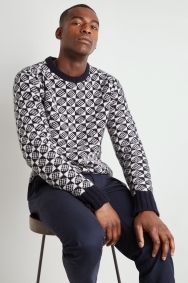 Featuring a crew neck, chunky knit and unique navy and white design, it’s an on-trend way to keep the chill off during colder weather. And, thanks to its lambswool rich material, you’ll feel comfortable whether you’re out for a leisurely stroll or battling through weekend errands. 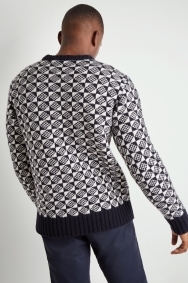 Pair with dark jeans and brown brogues for a laidback look that doesn’t compliment on style.
? ?it’s lovely and I loved.